This gallery of equipment images is designed to help you identify common types of construction tractors, both past and present. Crawler tractor: 1933 McCormick-Deering TA40 TracTracTor. 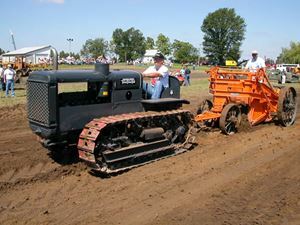 The term “crawler tractor” refers to the basic machine. 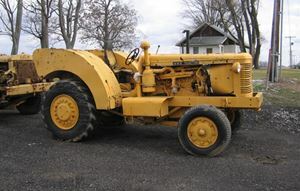 Crawler tractor and bulldozer: 1950 Caterpillar D8 with straight dozer and cable control. The dozer comes in several configurations, and is raised and lowered by a cable from a rear-mounted winch. 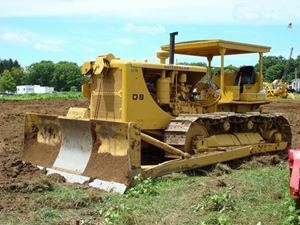 Crawler tractor: 1987 Dresser TD40 with hydraulic (as opposed to cable) dozer and ripper. The first rippers were pulled behind the tractor. Dresser bought International-Harvester’s construction lines. Traction engine: 1915 Frick Eclipse. 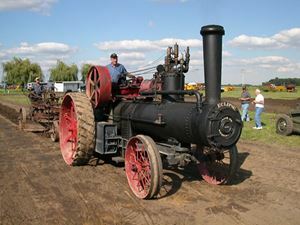 Steam-powered wheel tractors are referred to as traction engines, and are the ancestors of today’s farm and crawler tractors. Industrial wheel tractor: Early 1950s MRS 125. 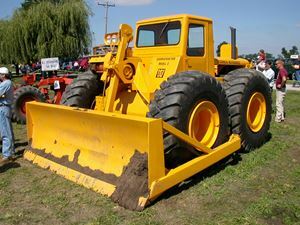 Similar in concept to smaller farm tractors, machines like this were designed for heavier construction and industrial applications. Wheel dozer: 1954 LeTourneau-Westinghouse model C Tournadozer. Crawler tractors were often used without dozers. 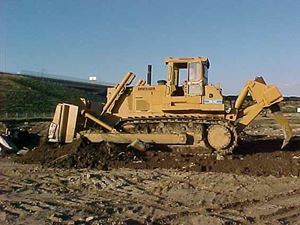 But wheel dozers are usually purpose-built for bulldozing applications.